ww2dbaseMamoru Shigemitsu was born in Oita Prefecture, Kyushu, Japan. He graduated from Tokyo Imperial University in 1907. He was the Japanese ambassador to China, Russia, and Britain prior to the war. Near the end of WW2, he was the Minister of Foreign Affairs of Japan. 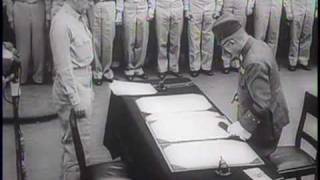 He was among the Japanese diplomats who arrived aboard the battleship Missouri to sign the instrument of surrender on 2 Sep 1945. After the war, he was tried for waging war and for "deliberately and recklessly disregarded their duty", and was sentenced to seven years in prison. He was paroled in 1950. He returned to politics as a leader of the Reform Party, and was the Foreign Minister between 1954 and 1956. 29 Jul 1887 Mamoru Shigemitsu was born. 27 Jun 1957 Mamoru Shigemitsu passed away.